Performance coach and psychologist Jamil Qureshi specializes in maximizing potential, having worked with 22 of the world’s top golfers. He was also the first official psychologist to work with the 2010 European Ryder Cup team as they made history in winning by a record-equaling margin. 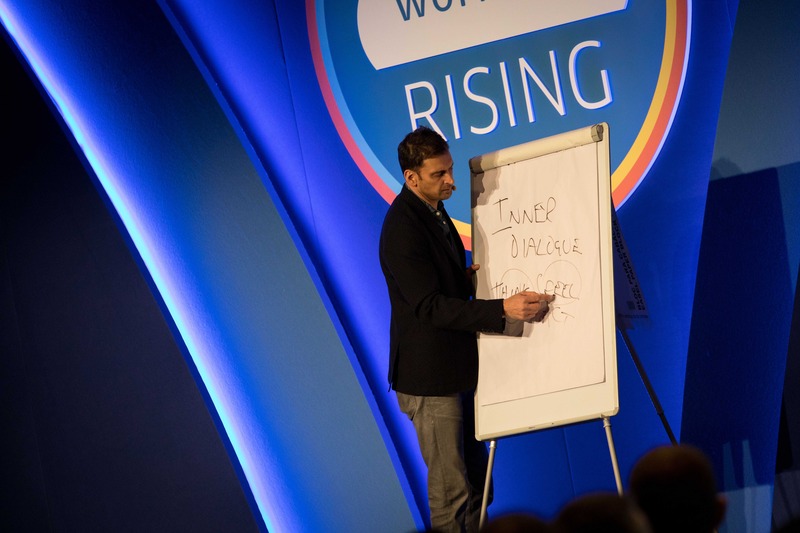 At Workday Rising Europe last week, Qureshi discussed his mantra of “act differently, think differently” in order to maximize the potential of leaders and teams. Qureshi, who delivered the conference’s Closing Keynote, said this requires rethinking the standard approach to change. He encouraged attendees to focus on making incremental improvements rather than taking a start-stop approach to change. Business leaders and individuals need to move away from trying to fix weaknesses and instead focus on improving their strengths. Qureshi discussed the importance of a positive inner dialogue, as “we think, then we feel, and then we act.” He said all human actions and behaviors start with visualizing things in our heads. Rather than trying to make people behave in a different manner, Qureshi said, business leaders should instead think of how they can positively impact their inner dialogues. When the late Welsh international footballer Gary Speed took penalty kicks, Qureshi said Speed would repeat one question in his head as he ran up for the kick: Would he run to the left or to the right to celebrate when he scored the penalty? In other words, Speed would visualize success rather than let any negative thoughts creep in, such as potentially miskicking. According to Qureshi, attitude is more important than intelligence or facts, and blame looks backwards while responsibility looks forward. It’s easy for businesses and individuals to point to many factors to blame for failure. Qureshi contends it’s not about circumstances, it’s about choice—the world is and always has been improbable and complex. In his final point, Qureshi commented that as humans we do three things with all information that comes our way; we delete, we distort, and we filter according to our own belief systems. In his role working with elite sports professionals, Qureshi said his biggest challenge was convincing them that the world that they are experiencing is merely a reflection of their own attitude towards it.